Much cooler and higher than the neighboring Great Basin Desert to the north and the Sonoran Desert to the south, the Mojave Desert is considered a rain shadow area, which occurs when an area of land is forced to become a desert due to mountains that block out rain that would otherwise allow most plants to grow. The Mojave Desert spans across a large region of southeastern California and through portions of Nevada, Arizona and Utah. In total, it encompasses more than 25,000 square miles of land. 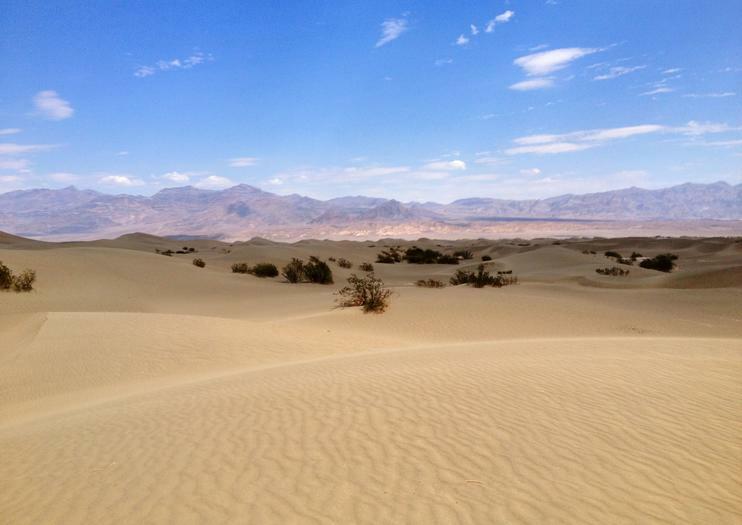 the Mojave Desert is home to an array of stunning, protected areas. The desert sits between 3,000 to 6,000 feet in elevation, much higher than the nearby Sonoran Desert. The elevation keeps temperatures slightly cooler. Visitors are primarily drawn to the area for natural recreation and to see the nearly 200 endemic plant species that only exist in the Mojave. Dunes. When traveling in the desert, always make sure to carry plenty of water and sunscreen. Experience one of the seven natural wonders of the world on this guided, full-day tour from Las Vegas to the Grand Canyon. Travel through the Mojave Desert — with stops at the iconic Hoover Dam and a Joshua tree forest — en route to the Grand Canyon’s West Rim. Meet members of the Hualapai Tribe, take a thrilling walk on the glass-bottomed Grand Canyon Skywalk, or simply roam and enjoy the breathtaking scenery. Lunch, bottled water and hotel pickup and drop-off are included on this small-group tour. This tour is designed for the 18-35 year old backpacker crowd on a budget!The tour is packed with California Coasts, Deserts, Casinos, National Parks, Cities and more!Our expert guides will take you to the most well known locations plus countless hidden gems!Most of your food is included and so is the camping equipment! Escape to the Grand Canyon for this exciting 4-hour sightseeing adventure. Enjoy a scenic flight from Las Vegas to the West Rim of the Grand Canyon, flying over the famous Hoover Dam and beautiful Lake Mead along the way to an exclusive landing at Valley of Fire State Park. Enjoy a complimentary Champagne toast, and soak up the one-of-a-kind view before your return trip to Las Vegas. Local hotel pickup and drop-off are included. Experience Las Vegas on an easy and affordable two-day tour from Santa Monica and Los Angeles. Enjoy a comfortable bus ride in a luxury coach with complimentary snacks and refreshments and an overnight stay at Harrah’s Hotel and Casino. Explore the strip on your own terms or upgrade to a “City Night VIP Tour” with this fun, flexible and convenient tour package. This tour is designed for the 18-35 year old backpacker crowd on a budget that wants to see it all. This fast paced tour packs in the most of any tour out there but still allows enough time to really enjoy your vacation. If you want to see and do as much as possible in one week this is it.Our expert guides will show you all the well known sites plus countless hidden gems. We take you camping in some of the most beautiful National Parks and stay in a casino right on the Las Vegas Strip! We use small 15 passanger vans with trailers instead of buses like everyone else so space is limited! Includes most of your meals, camping equipment and more.